The 'DICOM Viewer 2.0' developed by Rubo Medical Imaging is one of the most complete and powerful DICOM viewers around. It's capable of handling all DICOM files of any modality (X-Ray angiogram, ultrasound, CT, MRI, Nuclear, waveform etc. ), compression (lossless and lossy Jpeg, Jpeg200, RLE), depth or color. 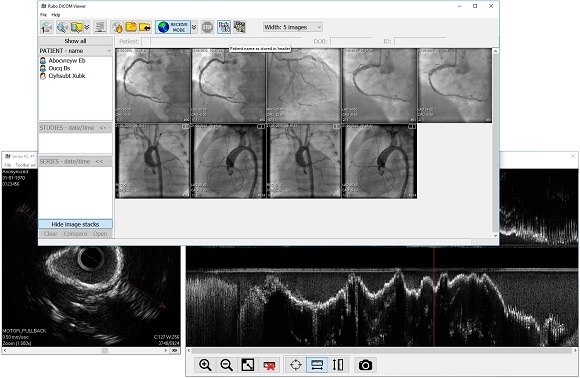 Combined with a user-friendly interface and features such as biplane display, multi-monitor, conversion to WMV, PACS/CD/Network overview, DICOM push/send, query/retrieve, image export, printing, DICOM CD burner, Waveform viewer, longitudinal IVUS viewer, DICOM anonymizer and much much more, makes the Windows based 'Rubo DICOM Viewer 2.0' a very powerful DICOM viewer and communication tool. View the DICOM Viewer capabilities and features. Download the demo of the DICOM Viewer. 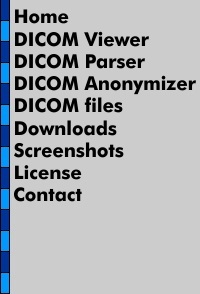 Download the free DICOM Parser. Download the free DICOM Anonymizer. View the online help files of the DICOM Viewer.